Survivor: The Australian Outback (2001) - 9th place, 8th out - 1st juror. Voted out in Episode 8, "Friends?" (Day 24). Survivor: All-Stars (2004) - 7th place, 12th out - 3rd juror. Voted out in Episode 12, "Stupid People, Stupid, Stupid People" (Day 30). The Australian Outback Ep. 1 RC/IC: "Bridging the Gap" - thanks to a capsizing raft, Kucha loses big. The Australian Outback Ep. 2 RC: "Butch Cassidy" - Everyone competes, Kucha loses again. The Australian Outback Ep. 2 IC: "Tucker'd Out" - Successfully eats a cricket, and in the tiebreaker, Kucha wins. The Australian Outback Ep. 3 RC: "Water Torture" - Carries water, but Kucha narrowly loses in the tie-breaker. The Australian Outback Ep. 3 IC: "Lock Step" - Runs well with Kucha, and Kucha wins. The Australian Outback Ep. 4 RC: "Master Mind" - Participates in the puzzle, Kucha wins chickens. The Australian Outback Ep. 4 IC: "True or Falls" - Answers the tiebreaker correctly, Kucha wins again. The Australian Outback Ep. 5 RC: "Triage" - Kucha wins its fourth straight. The Australian Outback Ep. 5 IC: "The Maze" - Somehow, Kucha loses. The Australian Outback Ep. 6 RC: "Blind Leading the Blind" - Kucha wins Doritos & Mountain Dew. The Australian Outback Ep. 7 IC: "Perch" - Lasts an amazing 10 hrs, 17 minutes; eventually gives up for coffee/cocoa and a boat ride in (3rd/10). The Australian Outback Ep. 8 RC: "Return to Sender" - Misses the target, but briefly the leader (5th/9). The Australian Outback Ep. 8 IC: "Don't Fence Me In" - Does not appear to score any points (bottom 3/9). All-Stars Ep. 1 RC/IC: "Quest for Fire" - Chapera wins easily (1st/3). All-Stars Ep. 2 RC: "Stairway to the Stars" - Chapera loses, but gets reward anyway. All-Stars Ep. 2 IC: "Float Your Boat" - Sits out as Chapera wins again (1st/3). All-Stars Ep. 3 RC: "Better Homes and Island Living" - Chapera builds the best camp, wins (1st/3). All-Stars Ep. 4 RC: "Match Maker" - Alicia makes the final match, and Chapera wins again (1st/3). All-Stars Ep. 4 IC: "Blind Leading the Blind" - Chapera loses! (3rd/3). All-Stars Ep. 5 RC: "Shipwrecked Raft Race" - Chapera finishes second (2nd*/3). All-Stars Ep. 5 IC: "Pilfering Pirates" - Now down to two tribes, Chapera wins again. All-Stars Ep. 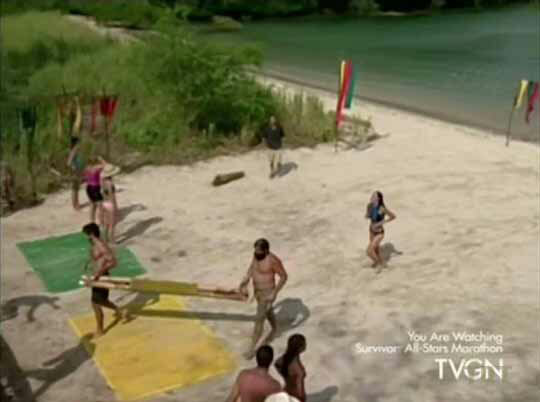 6 RC: "Tribal Stomp-ede" - Chapera loses Sue, then loses the challenge. All-Stars Ep. 7 RC/IC: "Blind Leading the Blind" - Chapera wins yacht feast, kidnaps Kathy. All-Stars Ep. 8 RC: "Log Jam" - .Chapera wins again. All-Stars Ep. 8 IC: "Choose Your Weapon" - Sits out of another Chapera win. All-Stars Ep. 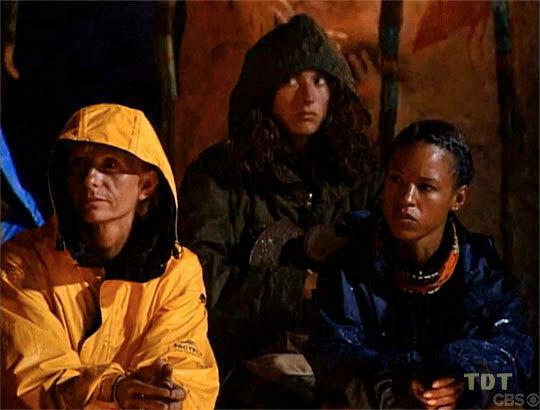 9 IC: "Survivor History" - Now switched to Mogo Mogo, and Mogo Mogo wins. All-Stars Ep. 11 RC: "Big Bad O' Course" - Part of the winning team, with Amber, Rob, and Shii Ann. *Note: Second-place finishes during the three-tribe phase of All-Stars count as a half-win. All-Stars Ep. 10 RC: "Rock Bottom" - Eliminated in the third round (tie-4th/9). All-Stars Ep. 10 IC: "Waiting to Exhale" - First woman to drop out (5th/5). All-Stars Ep. 11 IC: "Big Bad O' Course" - Although on the winning team in the RC part, does not win (tie-2nd/4). All-Stars Ep. 12 RC: "Face Off" - Second person eliminated (8th/9). All-Stars Ep. 12 IC: "When It Rains, It Pours" - Third person to drop out, fairly quickly (7th/9). The Australian Outback, Ep. 1: Debb Eaton (voted out, 7-1). The Australian Outback, Ep. 6: Kimmi Kappenberg (voted out, 6-1). The Australian Outback, Ep. 8: Five votes, from Tina, Colby, Keith, Amber, and Jerri (voted out, 5-4). The Australian Outback, Ep. 14: Voted for Tina Wesson (who won, 4-3). All-Stars, Ep. 4: Rob Cesternino (voted out, 5-1). All-Stars, Ep. 10: Lex van den Berghe (voted out, 7-2). All-Stars, Ep. 11: Kathy Vavrick-O'Brien (voted out, 6-2). All-Stars, Ep. 4: One vote, from Rob C.
All-Stars, Ep. 12: Six votes, from Amber, Boston Rob, Jenna L., Rupert, Big Tom, and Shii Ann (voted out, 6-1). All-Stars, Ep. 15: Voted for Amber Brkich (who won, 4-3). Kucha finally makes it to camp! Time to hug Skupin. I will ALWAYS wave my finger in your face! 10 hours is enough, Jeff. I'll take your hot cocoa and boat ride now. Well... it's immunity or bust! Eh, just a lightning strike a few feet away. Nothing to worry about. Sigh. The final vote is for Alicia, not Jerri. Hauling raft, with Rob C.
CBSNews.com (3/1/01): "Alicia Gets Muscled Off The Island"
Bruce Fretts at EW.com (3/16/01): "Buff Alicia is booted from Survivor"
Gretchen Carlson at CBSNews.com (5/1/01): "Life After the Outback"
USAToday community chat (8/16/01): "Alicia Calaway"
Rome Neal at CBSNews.com (4/22/04): "Adios Alicia"
Angel Cohn at TV Guide (4/27/04): "Survivor's Alicia Points Fingers"
Thanks to Muneeb Khan (@MUK734) for his assistance in compiling this list. "Alicia Calaway is a personal trainer currently living in Manhattan. Born in Bridgeport, Connecticut, and raised in Trumbull, Connecticut, where she lived for over 26 years, Calaway also lived in Norway for 2 months. She graduated from the Fashion Institute of Technology in New York City with two Associates in Applied Science Degrees, one with honors from the dean's list. Past professions include a computer graphic artist and aerobics instructor. Calaway describes herself as charismatic, competent and passionate, and enjoys cooking, entertaining, and horseback riding. The accomplishment she is most proud of is when she won the AAU (Amateur Athletic Union) Ms. Connecticut Amateur Natural Bodybuilding Competition in 1994. She is certified through the National Academy of Sports Medicine (NASM) and is a medical exercise specialist of the American Academy of Health, Fitness and Rehabilitation. She is also CPR certified with the American Red Cross. Her date of birth is May 1, 1968." "Since finishing ninth on Survivor: The Australian Outback, Alicia Calaway most recently worked in broadcasting as a health and fitness reporter for a network affiliate station in New York City. Prior to that, she worked for the Oxygen Network as a host and fitness correspondent for the program, Pure Oxygen. In addition, Alicia co-hosted and reported for the ESPN anthology series, The World's Strongest Man and The World's Strongest Woman. She also reported for the syndicated program Marjoe Gortner's Holiday Celebrity Sports Invitational and did freelance correspondent work for CBS' Early Show and the syndicated magazine show Extra. She was also a spokesperson for Reebok. In addition to broadcasting, Alicia has made personal appearances on behalf of companies within the entertainment and fitness industries, as well as non-profit organizations. She is also a mentor for teenagers. Born in Bridgeport, Connecticut, and raised in Trumbull, Connecticut, where she lived for over 26 years, Alicia also lived in Norway for 2 months. She graduated from the Fashion Institute of Technology in New York City with two associate in applied science degrees, one with honors from the dean's list. Past professions include work as a computer graphic artist, aerobics instructor and personal trainer. Alicia enjoys cooking, entertaining, and horseback riding. The accomplishment she is most proud of is when she won the AAU (Amateur Athletic Union) Ms Connecticut Amateur Natural Bodybuilding Competition in 1994. She is certified through the National Academy of Sports Medicine (NASM) and is a medical exercise specialist of the American Academy of Health, Fitness and Rehabilitation. She is also CPR certified with the American Red Cross. Alicia is currently single. Her birth date is May 1, 1968."